Five centuries years ago, a new technology swamped the world with data. What we can learn from the aftermath. Worry about information overload has become one of the drumbeats of our time. The world’s books are being digitized, online magazines and newspapers and academic papers are steadily augmented by an endless stream of blog posts and Twitter feeds; and the gadgets to keep us participating in the digital deluge are more numerous and sophisticated. The total amount of information created on the world’s electronic devices is expected to surpass the zettabyte mark this year (a barely conceivable 1 with 21 zeroes after it). Many feel the situation has reached crisis proportions. In the academic world, critics have begun to argue that universities are producing and distributing more knowledge than we can actually use. In the recent best-selling book “The Shallows,” Nicholas Carr worries that the flood of digital information is changing not only our habits, but even our mental capacities: Forced to scan and skim to keep up, we are losing our abilities to pay sustained attention, reflect deeply, or remember what we’ve learned. Beneath all this concern lies the sense that humanity is experiencing an unprecedented change — that modern technology is creating a problem that our culture and even our brains are ill equipped to handle. We stand on the brink of a future that no one can ever have experienced before. But amid the concern, that crisis began to generate something else: a raft of innovative new methods for dealing with the accumulation of information. These included early plans for public libraries, the first universal bibliographies that tried to list all books ever written, the first advice books on how to take notes, and encyclopedic compilations larger and more broadly diffused than ever before. Detailed outlines and alphabetical indexes let readers consult books without reading them through, and the makers of large books experimented with slips of paper for cutting and pasting information from manuscripts and printed matter — a technique that, centuries later, would become essential to modern word processing. To understand how these earlier generations coped with this flood of information is to help us appreciate the power of human ingenuity to take an inhuman-seeming problem and turn it to productive use — and even, sometimes, to exploit the aspects that seem most overwhelming at the time. Complaints about information overload, usually couched in terms of the overabundance of books, have a long history — reaching back to Ecclesiastes 12:12 (“of making books there is no end,” probably from the 4th or 3d century BC). The ancient moralist Seneca complained that “the abundance of books is distraction” in the 1st century AD, and there have been other info-booms from time to time — the building of the Library of Alexandria in the 3d century BC, or the development of newspapers starting in the 18th century. But what happened in the Renaissance was, like digital technology in our own time, transformative. It took overload to an entirely new order of magnitude. Up to this point, every existing book had been copied by hand — a task that could easily take one copyist a year or more. Books were expensive commodities, most often produced on commission and paid for in advance. The great medieval libraries accumulated manuscripts by the hundreds, but few people ever had access to that many books. The printing press changed that. First developed around 1453, the new technology invented by Gutenberg had moved beyond the experimental phase by 1480 and spread to some two dozen major urban centers, with many other short-lived presses in operation. Contemporaries at first raved about the great speed with which books could be printed, and also about the drop in price — by 80 percent on one contemporary’s estimate in 1468. But around 1500, humanist scholars began to bemoan new problems: Printers in search of profit, they complained, rushed to print manuscripts without attention to the quality of the text, and the sheer mass of new books was distracting readers from the focus on the ancient authors most worthy of attention. Printers “fill the world with pamphlets and books that are foolish, ignorant, malignant, libelous, mad, impious and subversive; and such is the flood that even things that might have done some good lose all their goodness,” wrote Erasmus in the early 16th century, in the kind of tirade that might seem familiar to anyone exhausted by what they find online today. More pragmatically, a contemporary jurist complained that the “multitude of volumes” also made it hard to find the books one needed at the bookstore. Happy the illiterate, exclaimed one Italian editor (in the preface to one of his many publications), to be spared the malediction of books! To confront this new challenge, printers, scholars, and compilers began to develop novel ways to manage all these texts — tools that listed, sorted under subject headings, summarized, and selected from all those books that no one person could master. Note-taking was one solution, which the humanist pedagogues advocated alongside their teaching of ancient rhetoric. But not everyone followed their advice to take notes from everything they read throughout their lives, and for those who didn’t, new kinds of reference books offered a ready-made version — collections of best bits that could be consulted using sophisticated indexes and tables of contents. In the Middle Ages, theologians and jurists had developed biblical concordances and alphabetized subject headings to manage their canonical texts, and with the explosion of printed books these tools were adapted to books for more general audiences. They were intended not just for specialists, but for busy rulers and merchants, preachers, teachers, and students. Printed reference books made a broad range of readers familiar with the use of alphabetical order and indexes. Printing also encouraged a trend toward ever larger reference books as each edition tried to lure more buyers by offering something of interest to everyone, or at least everyone who could read Latin. One of these was the “florilegium,” a book gathering memorable quotations (or “flowers”) from respected authorities of many kinds — religious writers, philosophers, poets, and orators. These had existed before as slim handmade collections but now grew into large printed volumes, sorted under a wide range of subject headings so that readers could find and use quotations on any topic on which they were speaking or writing. One spectacularly large reference book, the “Theatrum humanae vitae” (the “Theater of Human Life”), published in 1565, gathered examples of human behavior both good and bad from all periods of history, providing instructive ethical models and supporting evidence for every imaginable argument. These books themselves are no longer familiar to us (though “Bartlett’s Familiar Quotations” is a florilegium by another name), but the basic notion of selecting, summarizing, and categorizing information from multiple sources has grown only more important, underlying everything from Reader’s Digest to the most sophisticated online aggregators. The larger printed books became, the more they needed to offer guidance through their own texts. The tables of contents and alphabetical indexes developed by printers and authors to accompany them are still recognizable today. Other devices we would find bewildering: Some books came with diagrams of topics and subtopics in a hierarchical cascade of squiggly brackets that could sprawl over multiple pages. The charts in the “Theatrum humanae vitae” were so complex that they elicited a rare case of explicit feedback — a complaint from one early 17th century professor who found them useless and relied instead on the multiple alphabetical indexes also supplied in the work. More effective to modern eyes, though not as widespread, were tables of contents that outlined layers of subdivisions with successive indentations, as a PowerPoint slide might today (but without the bullet points). 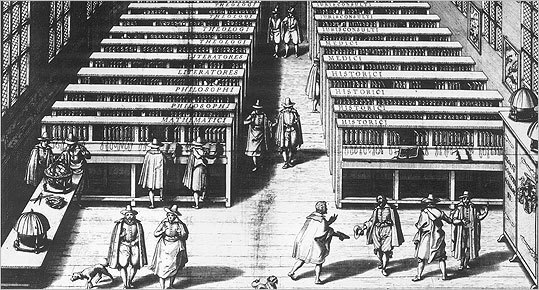 Some of the most ingenious techniques for information management in early modern Europe were devised by the compilers who composed the largest reference books, like the “Theatrum humanae vitae” and its even larger sequel, the “Magnum theatrum” (“Great Theater,” 1631). Compilers cut and pasted, very literally, with scissors and glue, from manuscript notes they had already taken — or, even more efficiently, by exploiting a new, cheap source of printed information: older editions of books. These slips were cut from a full page and soon glued onto a new sheet, but in the mid-17th century for the first time one scholar advocated using the slips themselves as an information-storage system. Crucial to this method was a specially designed piece of furniture: a note closet comprising slats studded with hooks on which the slips could be stored and labeled. Probably only a handful of such closets were built, but the slip — and the idea of the filing system — had a long career ahead. In the 18th century the political theorist Montesquieu took notes on the backs of playing cards, which were blank in those days. His younger contemporary Carl Linnaeus made his own slips for recording the characteristics of plants, from which he created a taxonomic system that we still use today. The slips, ordered and sorted, would eventually inspire both the index card and the library card catalog. The early modern experience of overload was different in many ways from today’s. For example, then only an educated elite and a few areas of life were affected. Today people in nearly every walk of life, at least in the developed world, rely on the Internet for much of their basic information. What we share with our ancestors, though, is the sense of excess. Most Internet searches will turn up vastly more results than can be used. Too much of the bad stuff, not enough of the good, has been the subtext of complaints about overload from the beginning. But like the early modern compilers, we too are devising ways to cope. In many ways, our key methods of coping with overload haven’t changed since the 16th century: We still need to select, summarize, and sort, and ultimately need human judgment and attention to guide the process. Some of our methods are similar, and others are completely new. Search engines like Google harness technology to do something that wasn’t possible earlier: using algorithms and data structures to respond to search queries that have never been posed before. Many of our tools will no doubt rapidly become obsolete, but a few of those may spawn useful offshoots, just as the note closet enabled the growth of sophisticated catalog systems. A new technology does not act alone, after all, but in concert with our ambitions for it. Overload has long been fueled by our own enthusiasm — the enthusiasm for accumulating and sharing knowledge and information, and also for experimenting with new forms of organizing and presenting it. Early modern compilers were driven by this enthusiasm, even beyond their hopes for acquiring reputation or financial gain. Today, we see the same impulse in the proliferation of cooperative information sharing on the Internet, such as the many designers and programmers sharing new ways to visualize and efficiently use huge quantities of data. In democratizing our ability to contribute to a universal encyclopedia of experience and information, the Internet has shown just how widespread that long-running ambition remains today. Ann Blair is a professor of history at Harvard University and the author of ”Too Much To Know: Managing Scholarly Information Before the Modern Age,” recently published by Yale University Press.